A history of this 19th century Bavarian style estate steeped in history and mysteries through three centuries of wonder and intrigue, with images by Patrick D. Wing & RS Wing. Destined to create his own Germanic bastion, Charles F. Dietrich bestowed his opulent wealth upon a life project to construct an estate nomenclatured Daheim, which defined in German means “the home”. Charles F. Dietrich was born in Germany in 1836, eventually becoming a very successful businessman and key engineer in the development of acetylene gas for illumination. He also was an original founder of Union Carbide. He was initially introduced to Millbrook by Henry James Davison Sr., a fellow civil engineer and colleague. For centuries there have been innumerable theories as to when and how the world might end. Possibilities put forward have ranged from nuclear war to destruction by a giant meteor-and even invasion from outer space. Some believers predict the coming of a Messiah, at which time all but they will be annihilated. English folklore claims this story as its own but it is actually more than 1200 years old and originates from the Middle East. The fairy tale about the babes in the wood is familiar to many people but there are some very ancient, historically based versions of the same story. The life of Sammu-rammat, the most powerful woman in Mesopotamian history. (Mespotamia is the name given to the ancient lands that lay between the rivers Tigris and Euphrates), is the well documented source of the children’s fairy story. Greek historian Herodotus told the story of Sammu-rammat who was born around 800BC and married Shamsi-Adad V, the King of Assyria. When the King, her husband died in 812BC, she took the role of regent for her son who was too young to rule as King, establishing and building strong political and economic bonds between the neighbouring countries of Babylon and Assyria. The crew of the H.M.S. Bounty mutinied, leaving their captain, Lt. William Bligh, and a few companions to fend for themselves in an open in the middle of the Pacific Ocean. Bligh survived his ordeal to become an admiral, but the tale of what happened to the ship and its mutinous crew is one of the most bizarre in the annals of the sea. 21st December 2012 ; World’s End? The basis that the world will end on 21st December 2012 has stemmed from the Mesoamerican Long Count Calendar, whereby the 13th b’ak’tun ends. An article surrounding the Mayan prediction that the world will end on 21st December 2012. Despite warnings from Nostradamus and the Queen, Catherine de Medici, the King of France, Henri II, insisted on taking part in a three-day tournament to celebrate the forthcoming double marriage of his sister and his daughter to, respectively, the Duke of Savoy and King Philip II of Spain. two breaks made one and then a cruel death. Whether it be optimistic visions of social progress and technological advances such as space and time travel, or doom-laden predictions of totalitarianism and Armageddon, human beings have been imagining future worlds for centuries. Way back when, there was a massive flood that saw the whole world submerged in water (allegedly). In 1524 it was predicted that another flood would hit the world. The prediction came from a group of eminent astrologers who predicted the flood would start from the river Thames. So severe was the threat at the time, that 20,000 people fled London to seek higher ground. The flood, of course, never happened. Flavia Iulia Helena is one of the few early saints that really existed. She must have been an energetic lady into high age. She shared the Roman Emperors penchant for building representative stone piles and went on a spending spree over churches. According to legend, she was one of the first archaeologists and an avid collector of bric-a-brac. Legend had her doing excavating work under the temple of Aphrodite erected by Emperor Hadrian over Golgotha and the Sepulchre. She was credited with finding the Sepulchre and the wood of the true cross. By the time she was leaving Palestine by ship, she had mysteriously acquired the nails as well, and the mummified bodies of the three Magi. The French writer Joris-Karl Huysmans started his career as a naturalist, but with A Rebours ("Against Nature") he wrote "the bible of decadence" and with Down There a history of Satanism, facts turned into fiction, a masterpiece of occult horror. 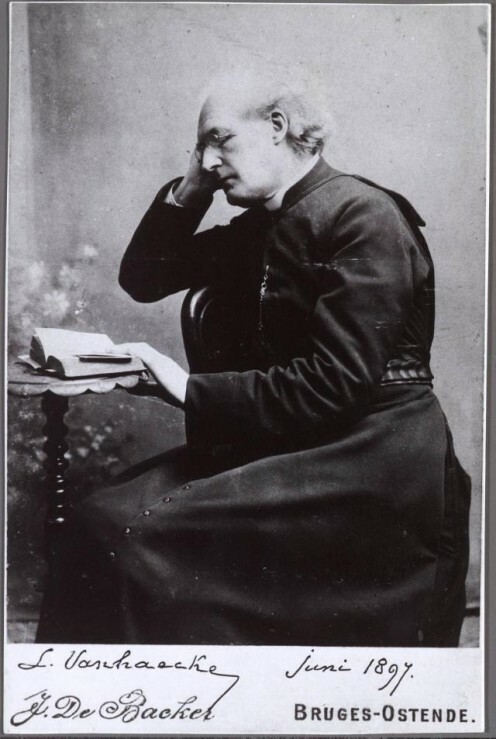 In 1890, the already famous French "decadent" writer Joris-Karl Huysmans wrote to a friend that he was looking for "a demoniac sodomite priest" who performed the black mass. He needed him for a new book, now known as Là-bas or Down There. In 1891 Joris-Karl Huysmans published his novel Là-bas in which he paints a fantasy of Satanism, such as it was reportedly still practiced at that time in Paris. 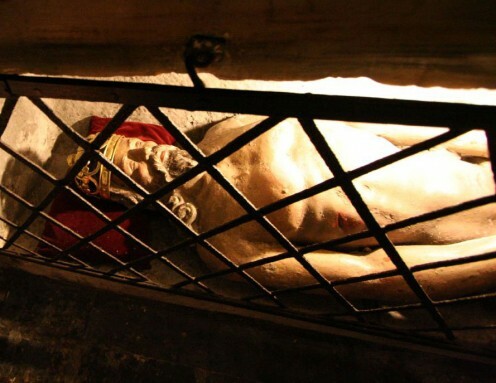 One of the most sinister figures however was the Chaplain of the Holy Blood of Bruges. The Code of the Holy Blood Imagine... 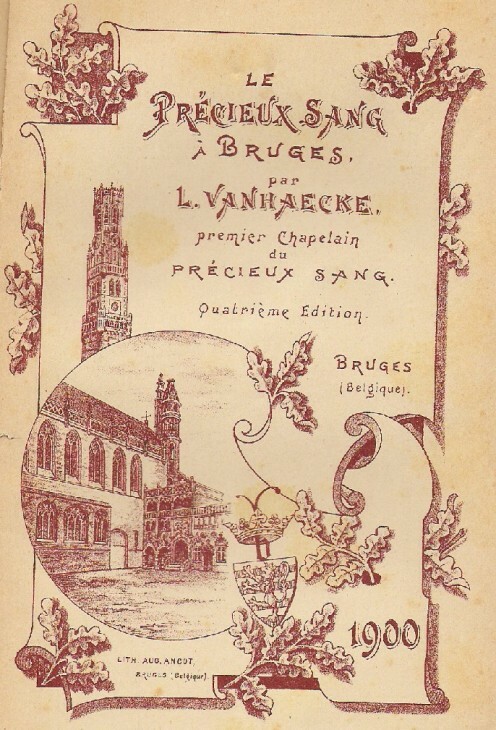 According to J.K. Huysmans, the Chaplain of the Holy Blood Chapel of Bruges, Louis Van Haecke, was a "Super Satanist"... And he also wrote a book... about the Precious Blood of Bruges... with a Code in it! Rennes-le-Château, a small medieval village in southwestern France, is internationally renowned for being in the middle of probably the greatest Conspiracy Theory of the 20th Century. A local restaurant owner wanted to increase business and spread some rumours of a lost treasure… And this was the origin for the non-fiction bestseller The Holy Blood and the Holy Grail or Dan Brown’s historical faction thriller The Da Vinci Code. 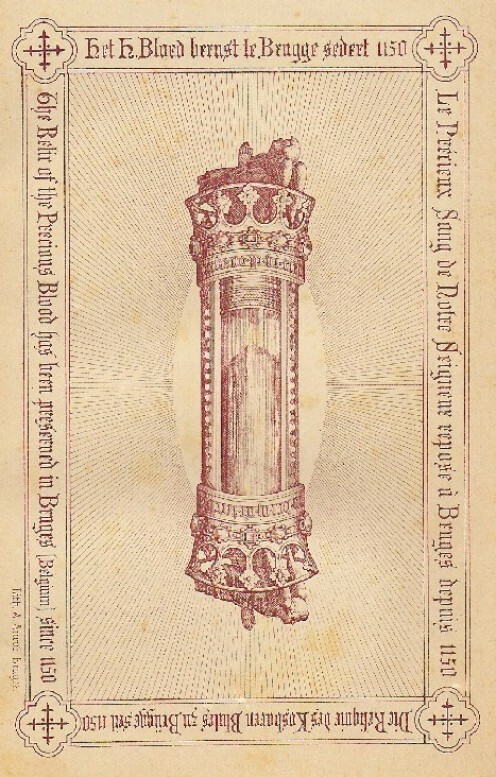 Every year in Bruges, on Ascension Day, the Procession of the Holy Blood takes place. The centerpiece is the coagulated relic of the Precious Blood of Christ. 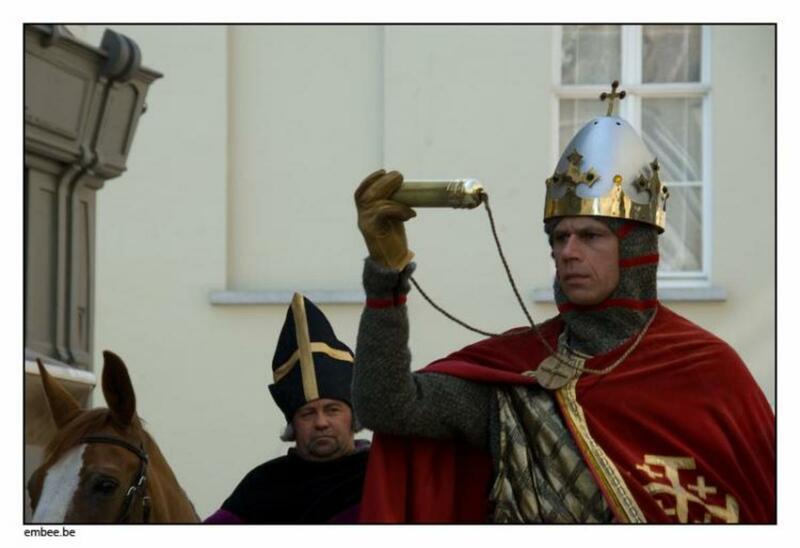 Sixty to hundred thousand spectators are watching this parade of historical and biblical scenes.